Our friends and traveling companions, Joy & George, picked us up at 5:45am because we had to be at the port at 6:30am in order to find a parking spot for their car on the ferry before our 7:30am departure from Nice to Corsica. 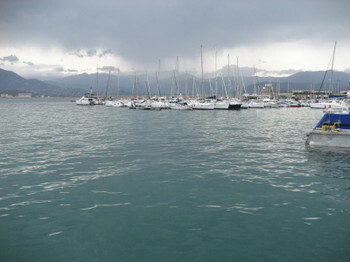 It was a 4-hour journey at 40 knots on the very comfortable, expansive SNCM NGV ferry to Ajaccio, the largest city (approx. 53,000 inhabitants) and the political capital of the island. 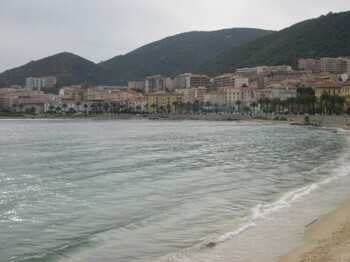 La Corse, as it is referred to on the mainland of France, is split into two départements, Corse-du-Sud (2A) and Haute-Corse (2B). 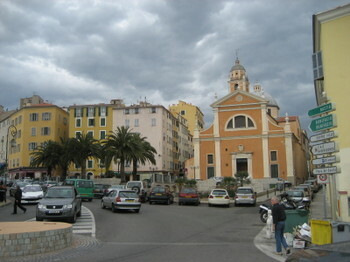 The approximately 250,000 inhabitants of the 4th largest island in the Mediterranean (following Sicily, Sardinia, & Cyprus ) refer to their homeland as Corsica. One of the most important names in Corsica’s history is one that I had never heard before, but one we came across immediately upon our arrival to Ajaccio. It was the Corsican general known as Le Père de la Patrie, and its most well-known freedom-fighter, Pascal Paoli, who first fought the Italians for Corsica’s independence, resulting in a 14-year reign as an independent republic in 1755, until the Genovese sold their claim to the island to France, at which time he continued his fight for independence against the French, resulting in his defeat in 1769. He was a military strategist and, what we would call, a Renaissance man, who is credited with drafting the Corsican Constitution, and with founding the University of Corte in the center of the island. 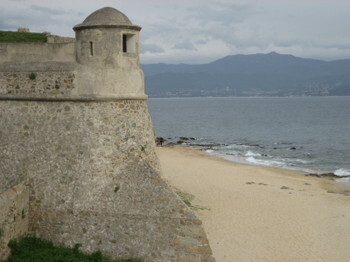 Of course, Ajaccio is most well known as the birthplace of Napoléon Bonaparte on August 15, 1769, and if you happen to forget this bit of information, you will be reminded of it with every step you take, by the many monuments, plaques, statues, museums, street names, etc., which pay homage to their illustrious native son. After checking into our room at the Hotel Fesch, conveniently situated in the centre ville, and stopping by Le 20123 to secure a dinner reservation for tonight, we headed out to explore our environs, starting with the Musée de La Maison Bonaparte, of course. 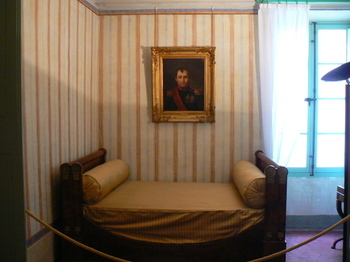 This family home where Napoléon and his siblings were born is now a museum devoted to the entire Bonaparte family. The rooms of the home are laid out with period furniture and family portraits and kitchen equipment & implements, etc. 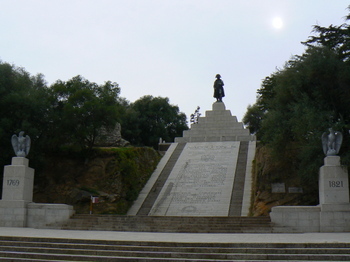 Along with the family tree and family history, there is also information regarding the history of 18th-century Corsica, including Napoléon’s musings regarding his once-hero-turned-enemy, Pascal Paoli. 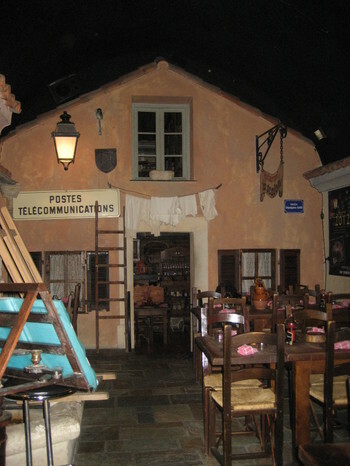 Although Napoléon never really ate here, dinner was memorable at Le 20123 (2, rue Roi de Rome, tél: 04.95.21.50.05 ), where we feasted on some of the local cuisine, including a plate of tasty charcuterie, stewed veal with green olives, a tomme cheese topped with a confiture of whole figs and walnuts (which we were able to purchase from the restaurant to take home with us), and finishing off with a chestnut ice cream covered in a sweet chestnut cream. The inside of the restaurant was made to look like the main square of a small village, complete with an ancient fountain which provided the source of the water we were served at our table. Of course, everything was washed down with a crisp chilled rosé.